Just when I’d “discovered the magic” of Celtic Thunder and become certain that nothing could more effortlessly succeed at making my ears bleed, a friend sent me a link to North Carolina’s WinterBand-the most disturbing Christian rock band since, well, since ever. If you’re a geriatric, hobo-wizard, Jesus freak with a dirty mop-head hanging from your chin, it’s probably not the best idea to be too critical of others. But that doesn’t stop WinterBand’s namesake, Steve Winter, from attacking Catholics, Muslims, democrats, women and countless others for the intolerable sin of being outside his confusing comfort zone. But let’s talk about their music. As it says on their website, WinterBand are a “father and son Christian rock/blues/metal band.” Steve plays guitar and his clean-shaven son rocks the drums. Their sound ranges from Led Zeppelin to ZZ Top to The Spin Doctors, and if you close your eyes and pretend you’re not listening to a crew of inflammatory religious fanatics who dress like homeless warlocks, they’re actually pretty hilarious in a campy sort of way. Senator Zell Miller is apparently a fan. Best of all they’re prolific. For the uninitiated, I’ve assembled a collection of their essential work. This SEO-inflected doozy was produced on the eve of the 2008 presidential election “as an act of patriotism and reverence for 911.” If you like the political stuff, don’t miss the McCain Boogie, which features some fine guitar work by Winter. Prog rock meets pro-life lunacy… somehow the two just seem to go together. Perhaps their heaviest rocker. If Winter had some bat blood in that tangled mop on his face, it would almost feel like they’re channeling Black Sabbath. Some serious shredding by Winter on this one. Another rocker and winner of WinterBand’s most badass title. I’d love to hear Mastodon do a cover. 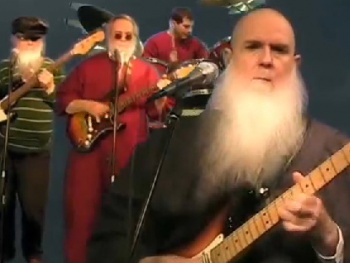 In Winter’s own words: “It is a sin for women to speak out and address the congregation during a worship service and rebellion is as the sin of witchcraft.” On the other hand, Jesus loves hearing second-rate Moody Blues jams performed by men dressed like J. R. R. Tolkien characters. This little anti-Muslim ditty is the subject of a confusing anticensorship tirade on the band’s website that I’m tempted to make fun of, but will avoid doing so out of fear that Winter will try to locate me and kill me. Musicians, take note! “WinterBand is looking for a new bass player to allow Bobo to fulfill his long term ambition to pursue a career as a greeter for a well known discount chain. We will miss him but must agree that it is for the best. It would be nice if the new bass player was better than him.” Clean-shaven effeminate pussies need not apply.